Below is the overlay of monthly 2010 Bakken wells and 2017 wells. The 2017 wells will struggle to reach 250 MSTBO EURs. A total waste. On the right is a comparison of the GOR behavior of these 2 groups of wells. In short (IMO) , this reservoir is over-drilled, over-fraced, and over pumped and the glorious completions are reaching out for life-support that does not exist. Which is exactly what the physics dictate. It clearly illustrates the danger of simply extrapolating a prior decline behavior on an increased IP. One of the companies in the Bakken I have closely followed for years is Oasis. Below is a screenshot (from shaleprofile of course) that shows the development in GOR for the average Oasis wells of 2010 and 2017 vintages. (The leading month in 2017 is one well only, total number of wells started by Oasis in 2017 in the Bakken was 91). While we are at Oasis. 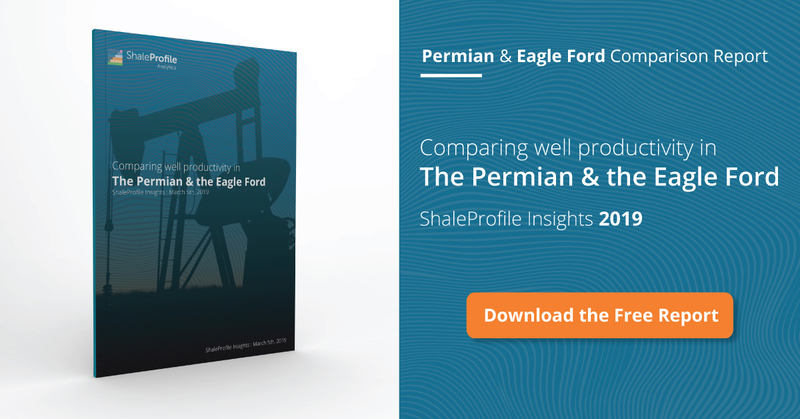 In one of their SEC filings for 2017 it could be derived that the average cost for their wells (during one quarter) was (from memory) in the range of $13M – $15M. The results from this (2017) may be observed from the charts below. The Oasis 2017 wells have had a better initial performance (faster build in cumulative) than older vintages. Despite the faster extraction there is always the question about improvements on profitability. Based on what guidance actual data (inclusive the oil price) provides, I think we already know the answer to that one. 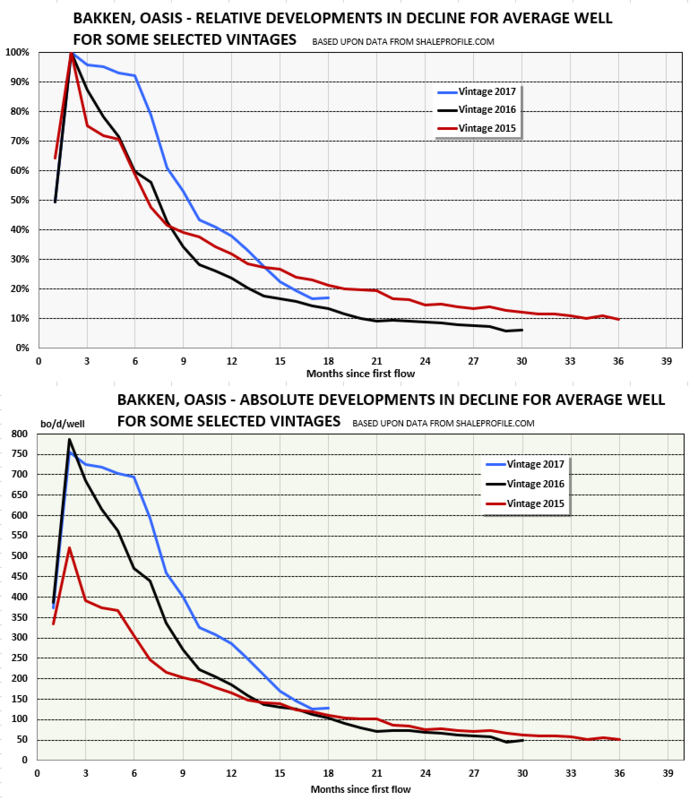 The charts below show developments in actual and relative declines for the average Oasis wells of 2015, 2016 and 2017 vintages. Note how the 2016 and 2017 vintages in absolute terms falls below the 2015 vintage in less than 20 months after first flow. Thanks for your analysis Jim. It looks like the 2017 wells group together had a peak IP in month 3 of 627 barrels per day. 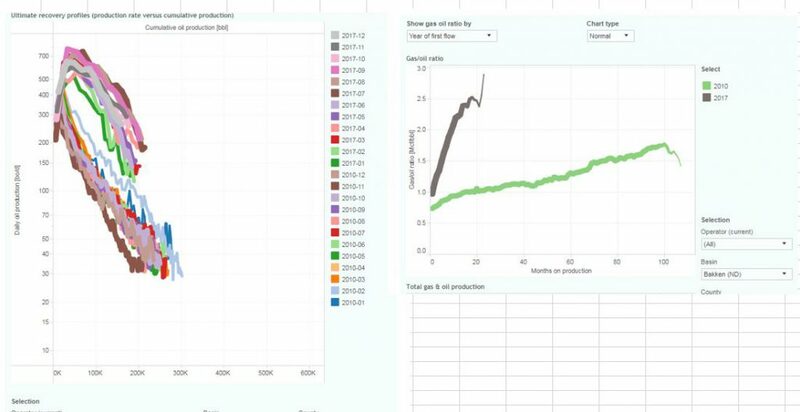 It looks like once all wells have a 15 month production number that number will be close to 200 barrels per day in month 15. That is almost a 70 percent decline rate in the first 15 months. Jim Booker you are right the Bakken is aging very fast. Also it looks like 2018 well decline rates will be just as bad as 2017 or worse. I believe that ND wants the NG capture rate to exceed 88%. That is going to be tricky because that is an expensive proposition. Pipelines need to be built and it is going to be discounted. In November 2020, the gas capture rate increases to 91%. The statewide gas capture in November is a paltry 79% vs. the required 88%. Interesting Krishnan. Also curious how ND is going to deal with this. 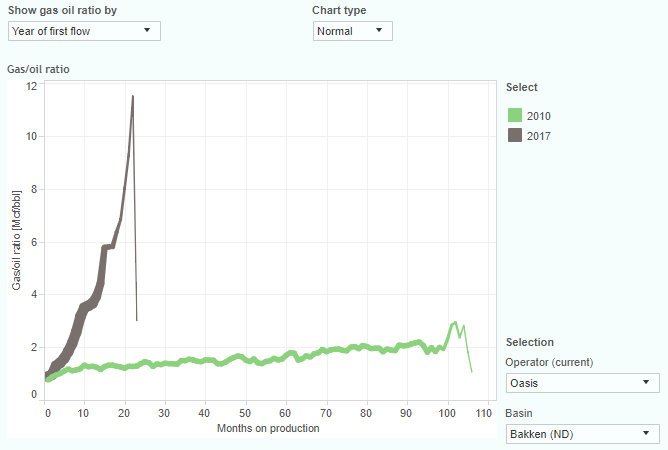 I estimate that November 2020 gas production will be at least 20% higher than it is now. I think Jim is right on the bullseye. Its only my wild eyed guess Enno, but perhaps ND will just have to start paying attention to the paltry revenues it can get from a natural gas stream. I don’t know what else ND will have by then. Maybe NG will become economically important to ND government. Thanks. That GOR behavior for Oasis is astounding. I think if one simply normalized all these wells by production per stage and graphed the results would be astounding. I liken this to drilling and fracing a vertical well every 528′ (10 stages over a mile) to drilling a vertical well every 200′ (50 stages over 10,000′). Everyone should understand that the closer you space wells, the more they interfere and thus production will be accelerated but ultimate recovery may not be worth the investment. 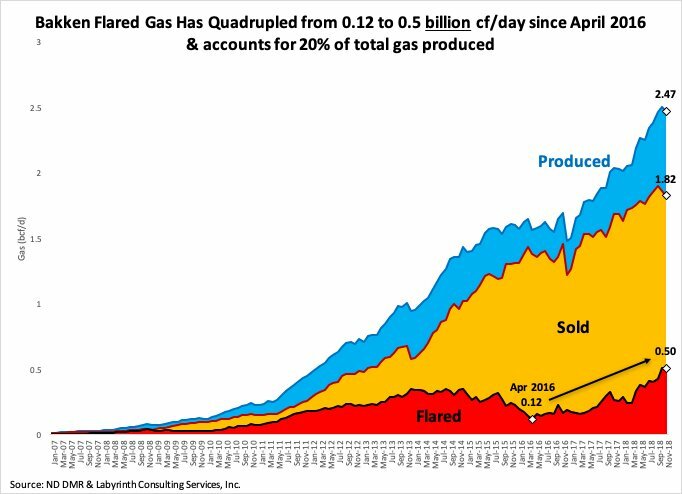 Flaring is increasing in the Bakken and long term, meaningful economics are getting worse, not better; yesterday NDS was $42 and change. As GOR continues to increase the term associated gas may need to be changed to associated oil. Graph courtesy Art Berman. The chart below is an update based on actual data as per Nov-18 on net cash flows for LTO in the Bakken as one big project. 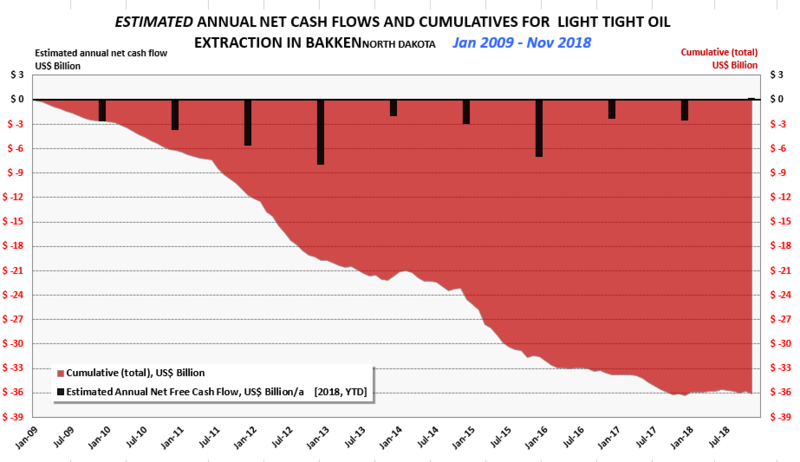 Collectively the operators were on a course of being slightly cash flow positive (from operations), but the collapse in the oil price in October and a temporarily widening spread between WTI and North Dakota Sweet has changed that and for all 2018 it is now expected that Bakken will be cash flow negative of an estimated $0,2 – $0,3 Billion. With a few companies claiming they are starting to “manage the plateau”, when do people think Bakken will peak and at what level? Can it grow a 300 kb/d more before it peaks?? 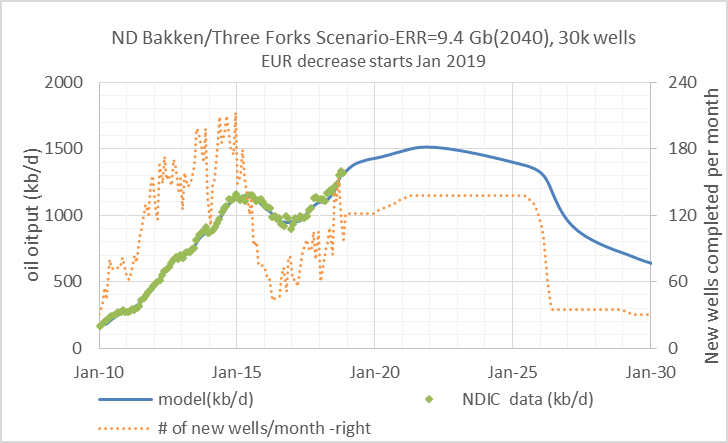 A conservative Bakken Scenario is below, 30,000 total wells drilled from 2000 to 2041 in North Dakota Bakken/Three Forks with economically recoverable resources of 9.4 Gb form 2000 to 2040. Peak about 1500 kb/d in 2022, about 200 kb/d above Nov 2018 output.